Oil and Gas Money in 'Green' California Politics? Can California politicians fight climate change if they get tens of millions of dollars from oil industry? 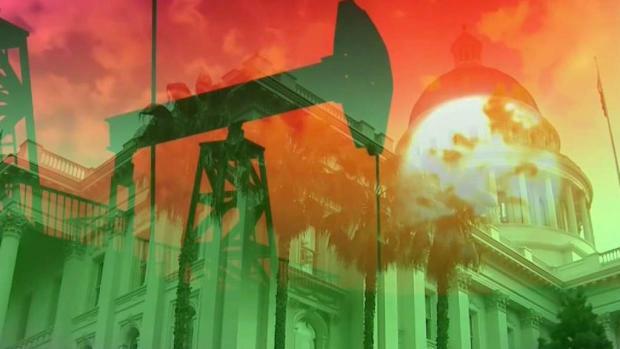 You may not realize it when thinking about politics in environmentally conscious and “green” California, but an 18-month-long NBC Bay Area and Maplight investigation found the oil and gas industry paid $182 million to California politicians, PACs and political causes between 2001 and June 30, 2018. For the past year and a half, the Investigative Unit worked with Maplight, a nonpartisan group based in Berkeley that tracks campaign contributions to uncover just how much money and influence the oil and gas industry wields in Sacramento. You may not realize it when thinking about politics in environmentally conscious and “green” California but an 18 month long NBC Bay Area and Maplight investigation found the oil and gas industry paid $182 million to California politicians, PACs and political causes between 2001 and June 30, 2018. For the past year and a half, The Investigative Unit worked with Maplight, a non-partisan group based in Berkeley that tracks campaign contributions to uncover just how much money and influence the oil and gas industry wields in Sacramento. Investigative reporter Stephen Stock reports on a story that first aired Oct. 1, 2018. "It's a tremendous amount of money," said Daniel Newman, the founder of Maplight, about the contributions from oil and gas. Newman started Maplight in 2005 in order to show voters the impact that money has on our political system. In the chart below, see how much individual California politicians received from the oil and gas industry. See how much money in campaign contributions employees, executives, PAC’s and corporations connected to the oil and gas industry gave California state politicians and those running for state office since 2001. Two weeks before Election Day and the money to California politicians has picked up, including from a major player -- the oil and gas industry. Critics say it contradicts California's image as a green, environmentally conscious state. But as the governor recently told us, there's no way around it. Money fuels any politician. Senior Investigative Reporter Stephen Stock has been crushing the numbers for months now, and has an update on campaign contributions. Here’s a chart of the largest contributors from the Oil & Gas Industry. And the amount oil and gas has spent in Sacramento is not insignificant when compared with other industries and other states’ politics. The $182 million in political contributions put the oil and gas industry in the top eight of all industry and special interest givers in California, according to the National Institute on Money in Politics, a Washington, D.C.-based nonprofit that has documented more than $100 billion in special interest contributions to state and federal political campaigns. The $182 million spent in California by oil and gas ranks at the top compared to other states. In fact, oil and gas gave more to political causes in the “green” Golden State than the industry did to state politics in New Mexico, North Dakota, Montana and Texas combined, according to the same data from the National Institute on Money in Politics. “I think it’s absolutely the political process we live in,” said Catherine Reheis-Boyd, referring to the large amounts of money in politics. Reheis-Boyd is president of the Western States Petroleum Association, which represents the oil industry in California, Arizona, Nevada, Washington, and Oregon. When asked if oil and gas had Gov. Jerry Brown’s ear, she said that “yes” she is confident that the oil industry has a good relationship with Brown and the Legislature. “I would say we've made great progress with being able to have a seat at the table with the environmentalists,” she said. Catherine Reheis-Boyd, president of the Western States Petroleum Association, says, "we are all environmentalists," in this extended interview with Senior Investigative Reporter Stephen Stock about doing business in California and what kind of money it takes to have a "seat at the table" in Sacramento politics. Reheis-Boyd points out that if California intends to remain a leader in green policy, the state has to set an example of how green reforms can be made without impacting businesses. “If we don't do that in a cost effective way, no one will follow,” said Reheis-Boyd. “You can't hurt business in the state and still have and expect a growing economy." Contra Costa County resident and activist Pennie Opal Plant remains concerned about the role the oil industry has taken in shaping climate policies in California. “This is a crisis,” she said, “and it's time for all of us to come together and deal with the crisis.” Plant, who owns an art and jewelry business in the East Bay, joined 800 environmental and social justice groups to protest Brown’s recent Global Climate Action Summit held in San Francisco. “I’m working day and night and doing my best to inspire people to rise for climate,” said Plant, who is convinced that despite the green image of Brown, the influence of oil money is thwarting real progress. Brown recently signed landmark legislation, SB 100. It mandates California transition to 50 percent wind and solar energy by 2026, 60 percent by 2030, and by 2045, 100 percent zero-carbon electricity. Zero-carbon means no coal, oil or gas. The bill also calls for 5 million electric vehicles on California streets by 2030. Food and Water Watch focuses on sustainable energy as a key part of its mission statement. Scow said SB 100 has serious shortcomings. “It doesn’t ban fracking, and it doesn’t phase out oil drilling,” he said. Scow also takes issue with the timeline. “We don’t have 27 years to get there,” he said. Detailed in a report they’ve titled, “Brown’s Dirty Hands,” Court says he and his team found $9.85 million in political donations from the oil industry to Brown’s campaigns, ballot measures and favorite causes. “Our governor really is one of the most spoken people in the world against climate change. He hasn't laid a finger on the oil companies or the gas companies and part of the reason is because their fingers are busy shuffling out the cash in Sacramento,” said Jamie Court of Consumer Watchdog. “You take oil industry money, you can’t stop drilling in this state. That’s the problem,” Court said. According to data obtained from the California Department of Conservation, 23,892 new onshore oil drilling permits have been granted across the state since Brown took office in 2011. NBC Bay Area asked Brown if he can consider himself a climate leader while he and other Democrats take millions of dollars from the oil industry. "Politics runs on money, billions and billions of dollars,” Brown said. He stressed that his campaign accepted money from everyone. “If somebody wants to contribute to a proposition ... an oil company or a sugar company or a Hollywood movie company, we’ll take it," Brown said. The governor insists that those contributions have not stopped him from aggressively pursuing green policies.